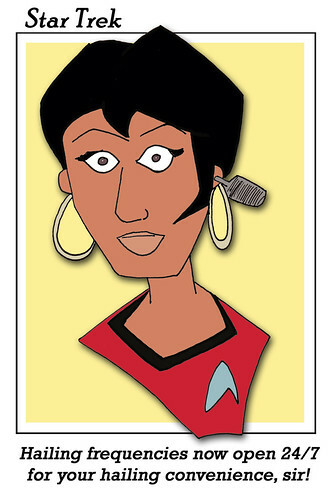 Continuing with my Star Trek cartoon-fest, I decided to try a more life-like version of Lt. Uhura, but after several hours of gloom, despair, and agony on me, all I could came up with was something that sort of looked like her, if you squinted your eyes and stood way, way back – with the lights off. 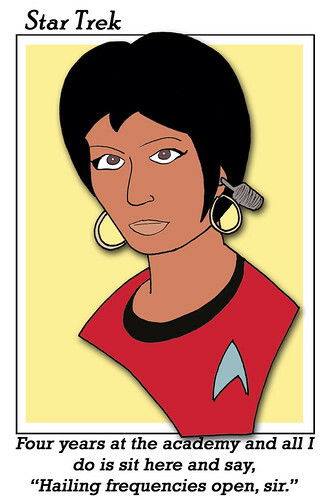 The only thing that’s recognizable as being Lt. Uhura-ish is the thing that’s sticking out of her ear. I took it to my son and asked what he thought. Sorry, Nichelle. I did my best.